We also strive to build positive and productive relationships between specialists and international companies. Our openness, honesty and diligence allows us to build repeat long-term “win-win” partnerships. 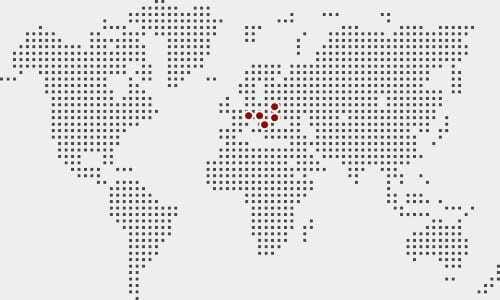 International operation of the company through experts abroad (Czech Republic, Ukraine, Serbia, Benelux, Germany). A greenfield project for a global supplier of automotive components for leading car manufacturers. Extension of service portfolio and implementation of turnaround and restructuring projects for international automotive clients. Implementation of ISO 9001: 2015 and ISO 14001: 2015. Implementation of LEAN, Toyota Kata and production management projects for TIER 1 and TIER 2 car manufacturers and suppliers. Launch of SAP B1 business information system. Establishment of Wesconi, s.r.o. in Slovakia. Extension of plant in Slovakia for an international client and establishment of a new factory. Establishment of Wesconi in Germany and implementation of projects through Interim Management. Slovakia, officially the Slovak Republic, is a small country in Central Europe, which emerged on 1 January 1993 after splitting from Czechoslovakia. It has an area of 49,036 km2 with a population of approximately 5.43 million. The capital of Slovakia is Bratislava. Other big cities include Košice, Prešov, Žilina, Nitra, Banská Bystrica, and Trnava. Since 1 May 2004, Slovakia has been a member of the EU. Since 21 December 2007, it has been a member of the Schengen Area. Slovakia is the world’s largest producer of cars per capita. In 2018, more than 1,080,000 cars were manufactured on production lines. The country is the world’s largest producer of cars per capita. Slovakia has a strong tradition in machine production as well as a sufficient number of qualified and motivated professionals. The Central & Eastern Europe (CEE) region consists of the Czech Republic, Poland, Slovakia, Hungary, Serbia, Romania, and Bulgaria. The economic growth of the CEE region has recently exceeded the overall results of the global economy. The region retains the prerequisites for maintaining economic growth. Good outlooks are primarily the pro-reform-orientated economies that joined the EU to improve the business environment, as well as tax and social reforms. Each CEE country offers different added values for investors, a specific business environment, and a unique culture. Poland, the Czech Republic, Hungary, and Slovakia are internationally known as BCC (Best Cost Countries) – an economically attractive combination of automation, process stability, and productivity with low wage costs.